Robox was recently recommended by 100% of users surveyed in the 3D Hubs global survey of users 2015. First launched at the end of 2014 Robox has had a very successful year, not surprising as Robox is half the price of competition but includes a lot more future proof innovation. The HeadLock system is a tool-less locking system with plenty of scope for high powered and complex additions to the rigid 3 axis frame. We are developing a range of optional modules which connect to this system. Future modules could turn Robox into an automated light machining rig, a 2D drag knife cutter, or even a paste extruding system for ceramics, chocolate, and a whole lot more. Robox is more than just a 3D printer. Needle Valves – A patented feature unique to Robox. Increases material compatibility and reduces flaws caused by stringing. A certain stop to the flow of material rather than relying on filament retraction as in all other 3D printers. QuickFill™ Dual-Nozzle Technology – 3D Printing is much faster than traditional prototyping methods but still takes time. Robox users can enable faster prints by using the large nozzle to fill unseen internal sections. Both nozzles can be used in the same print for faster print times without sacrificing detail. In this head both nozzles are fed from the same reel of material. The large 0.8mm nozzle can quickly create a model with exceptional strength due to a large wall thickness and fast print time with large layer heights (up to 400 micron/0.4mm/400µm). 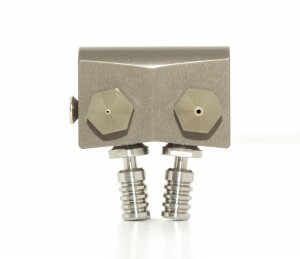 The small 0.3mm nozzle for fine details and extremely low layer heights (down to 20 micron/0.02mm/20µm). optimum orientation and tell the software to generate automatic support using either material loaded. Needle Valves – A patented feature unique to Robox. The needle valves help prevent stringing of low viscosity materials which experienced 3D print users will know to be a problem. Two independently controlled heater elements give high levels of control across an immense range of materials. The allowed temperature range enables this head to use even the most advanced plastics being developed for 3D printing. Many 3D printers use open source or cheaply available electronics; these certainly have their place in the world but nothing beats a product made specially to perform a specific task. 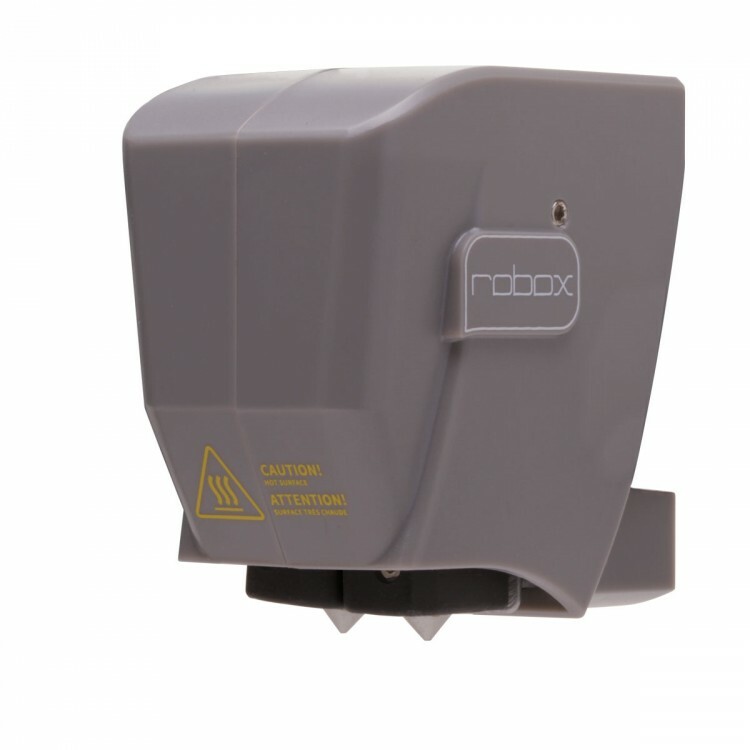 Robox has a bespoke mainboard which runs an Atmel® processor and custom-made firmware to control motors, monitor filament usage and temperatures and run the unique SurePrint™ tasks which make Robox work reliably and safely at all times. The internal power supply provides power to all the electronics and has been specified to provide the fastest heatup times of any plug’n’play 3D printer. 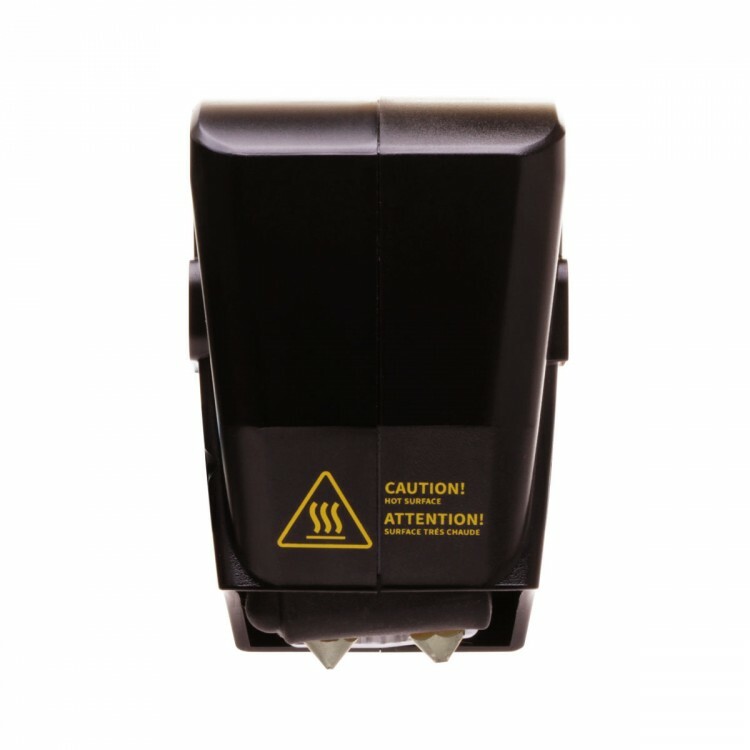 This greatly improves the printing experience and because the user is present to watch the start of the print it also reduces failure rates and wasted filament. All this intelligence built-in is not enough to create a class leading micro-manufacturing platform. A rigid 3-axis frame provides a basis for a highly accurate, low maintenance, Cartesian system – this frame format is common of high end CNC machines and many other 3 axis machinery. By using this design and the HeadLock tool attachment we intend for Robox to be much more than just a 3D printer. Parts which are critical to the success and precision of an operation have been carefully selected and, if required, made specifically for Robox. The Metric fine threads of our Z axis drive motors are custom-made and fitted directly to stepper motors on each side of Robox. The Z axis frames are driven up and down on precision ground stainless steel rods to provide the best Z resolution of any 3D printer on the market. Precision components – Bearing surfaces are machined to an exceptional tolerance and matched to high quality linear bearings. Threaded rods are custom made with a metric fine pitch to increase accuracy in very low layer heights, e.g. 20 micron. A stainless steel sheet is carefully shaped to provide a rigid base for the frame and fixed to our injection moulded housing to provide a product which is easy to manufacture to enable the best quality output from our manufacturing partner. 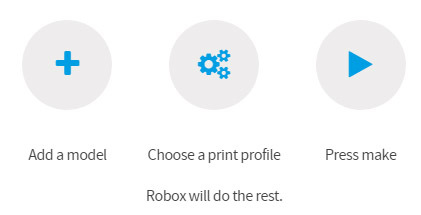 Robox has been designed to be mass manufactured; this simplifies the process which in turn improves the quality of the final product but without increasing the price for the end user. More reliable, repeatable, better quality production, not just for us but for the users of Robox as well. Each Robox filament SmartReel is fitted with a rewriteable EEPROM microchip to store material data and enable automatic recognition of a wide and growing range of materials we supply including PLA, ABS and HIPS in a choice of exciting colours. With this system, we already support the widest variety of materials on the market. Robox users are not locked into a material system, Robox is able to use any compatible material from any manufacturer. In such a new and quickly developing world of material development it is very disappointing to see so many 3D printer manufactures limiting the creativity and inventiveness of their users. Material partnerships let us provide the best, most useful and most popular materials on our SmartReels. Companies like Colorfabb have amazing materials so instead of competing with them we partnered to provide our users with the best materials on the simplest reel system. Index wheel – The volume of filament is determined by the software and fed to the nozzles by a stepper motor; this is common of most 3D printers. Indexing in the SmartExtruder enables automatic loading, fault detection, and measures filament used since the quantity of filament used to create printed parts is critical. So important, in fact, that Robox was designed to constantly check that the volume required matched that which was actually being fed to the nozzles. This design is so successful that another leading 3D printer brand immediately added a similar function to their flagship printer. Over 4Nm torque – The required torque for most print materials is much less than this but this headroom allows Robox to print with a much wider range of materials and reduces the chance of print failures common in many other 3D printers. Dual feed wheels for zero filament slip – In the Robox extruder the filament is trapped between two counter-rotating wheels which grip and push the filament toward the nozzles. Flexible filament compatible (2016 onward) – Extruders manufactured before Jan 2016 may not be compatible with flexible filament. Check with your seller, a small inexpensive change is required to enable this on older extruders. 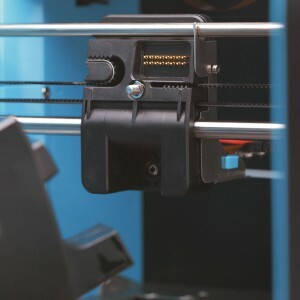 Space for optional plug and play 2nd extruder – Every Robox has space and electronics for an independent 2ndextruder to enable multiple material or colour prints (requires Dual Material Head). Heated bed – Vital for printing in certain materials, Robox bed heat up time to 130°C is approximately 8 mins, less than half that of any of our competitors. Compare bed heatup time with other printers, it is common to wait 20 mins, many take even longer. Removable 2 sided print surface – Almost no maintenance required, occasional cleaning of the flexible surface with alcohol at the most. 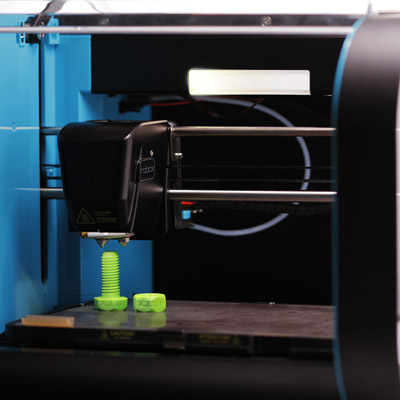 Other 3D printers require disposable surfaces like masking tape or even hairspray. Unique to Robox, 1mm thick and easily the best print surface for use with a heated or cold bed and most of the materials used in 3D printing today. ThermoSurface does not change size within the printer’s temperature range, so when the part cools it shrinks and just pops off. No effort required, no risk of damage to the surface or the printed part. Enclosed build chamber for a controlled environment and reduced shrinkage – A 3D printer without a case will never achieve the same accuracy in such a wide range of materials as Robox. User safety – The door locks while the internal surface are at dangerous temperatures, this prevents accidental burns and injury from moving parts. Desktop micro-manufacturing – Although 3D printers are normally operated in a workshop environment, Robox has been designed so every desk can accommodate it, it looks great too! The external dimensions (370 x 340 x 240mm 14.5 x 13.4 x 9.4″) have a generous build area approx. (210x150x100mm) – Although not as big as some, the studies we have done put over 90% of 3D printed parts well within these limits, even if you do need something bigger, the print time of large parts is prohibitive so splitting the part into smaller, easier to print sections is often wise. The simplicity of using Robox is deceiving, there are a lot of things going on every time you use a feature of Robox. To load filament you just poke it in a hole. Without any other interaction Robox will detect the type of filament installed and carefully load it, ready for printing. Data on what is loaded is presented to the user within the software and ready for the next step. The programmed three calibration steps for a Robox user could take an hour (usually more) of fiddling for the owner of a less intelligent printer. 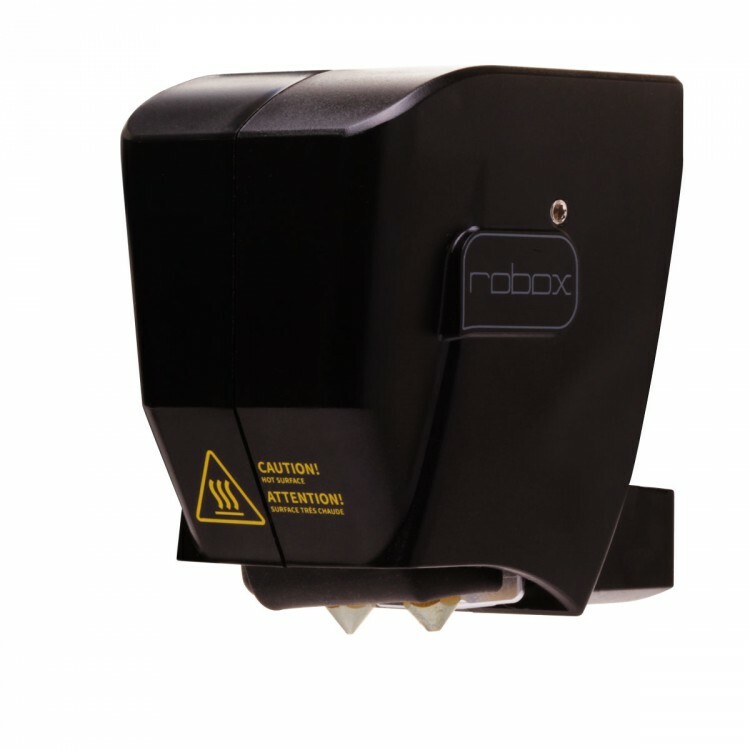 Before a print starts the bed and nozzles need to be heated, Robox takes all the required heater settings from the SmartReel™ and heats both bed and nozzles in a very short time, about five minutes for even the hottest settings. Next Robox will probe the bed in 9 locations, it builds a topographic map of the bed surface every time it starts a print and uses this data to ensure the nozzles are precisely distanced from the bed surface. Other 3D printers call this levelling the bed or gantry, usually a manual operation, Robox does it automatically. A mini purge refreshes the material in the nozzles and the print starts. The clever SurePrint system is running all the time in the background, constantly measuring, monitoring, and if needed, changing hundreds of variables to ensure the print succeeds. If something does go wrong, and to be honest things do occasionally fail to print, the SurePrint system will alert the user. There may be a tangle in the filament, maybe it ran out? In this case Robox pauses, lights flash, an alert appears in the software so the user can respond, resolve the problem and resume from where the error appeared. This pause feature is very robust and can be used to change filament colours, pause to insert captive nuts or other items or just to show off. AutoMaker is our free-to-use custom made interface software for Robox. Download it here to try some basic features and test it on your system http://cel-robox.com/downloads. AutoMaker runs on most current operating systems in many languages. 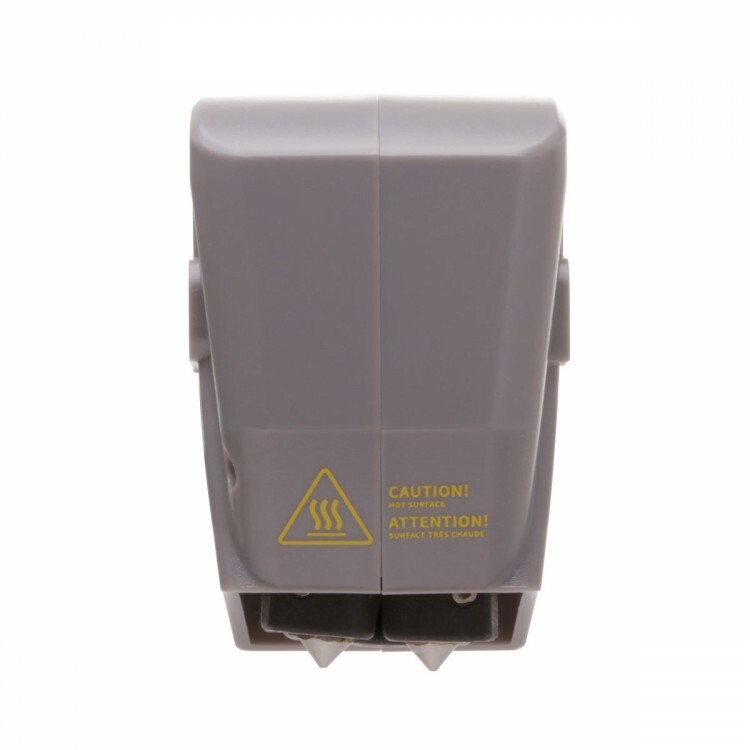 A simple and intuitive interface has been designed over a powerful and controllable back end. File compatibility is to be expanded from the currently supported .stl and .obj formats. A novice user only needs to load some filament, load their model in the software, and choose from Draft, Normal and Fine print modes and place their model in the software. Pressing Make does the rest. Three very easy steps with no prerequisite knowledge. Advanced users will find plenty of control to manage the finest details within a print or material profile. These profiles can be edited and shared with other users in the community. Model repository integration allows users to grab a model from the internet so it loads directly into AutoMaker ready to print.